When I was little, we used to swim at The Army & Navy Club in Roxas Boulevard. I don't think it's there anymore no? I guess going there and growing up in military camps pretty much my whole life have made military wear a staple in my closet. Especially since my Dad had a lot of those in HIS closet when he was still in active service. I am known to nab his US Army issue fatigue undershirt which was so thin and soft and worn in, it was almost like the burnout tees of today! But of course, I had to surrender it when my Dad looked for it, hahaha! So yeah, up to now, I have an above average number of fatigues, army greens and khakis, you can pretty much call me the Chief of Stuff (army stuff, hehehe). But I have my favorites at a time. Back in graduate school, it was a pair of fatigue cargo pants. Before the winter of 2009 struck, it was my J.Crew military boyfriend jacket. This spring, I'm bringing out the parka you saw above! I got that for about $30 from Gap months ago (maybe almost a year ago, Berry wasn't born yet then I think)! Here's what I wore under my parka, a tie front shirt dress from Margiela. It was on major clearance at Century 21! Bought for about $15 back in August. No kidding! It is an XL but I figured, I like slouchy clothes, and this would make a great breastfeeding dress. I just need to slide off my arm off the sleeves into the neckline. Of course, when I checked weather.com, I still needed to layer the dress with a cardigan. It wasn't that warm out as I thought. Speaking of Navy, that nautical themed denim tote on the lower right is just so me! I think that will look so cute with all my breton striped shirts! And! Surprise surprise! 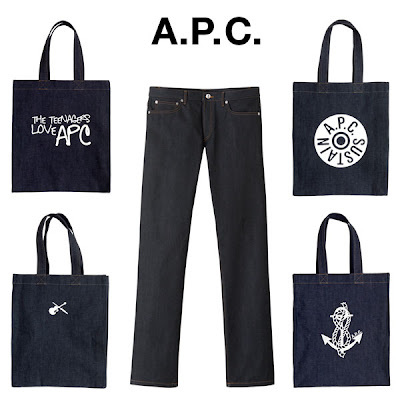 These totes here will only set you back $20, or about $22 with NY tax. Cheap but really great finds no? That's one thing the Army taught me. Because funds are limited, you need to scout for the best deals, always! i got this really comfy and nice infantry jacket from the gap! wore it @ the hermes event. i love it! LOVE the Margiela dress! I have to learn how to shop Century 21! OMG! I thought I was the only one going through it with Tia! I think Berry and Tia thinks we are their security blanket since we've been breastfeeding them this long. I have not been successful in weaning her. It's tough. So as for the anxiety separation, consider Berry your tail. Mine is beside me as I am typing...tippy toeing herself closer and closer to my lap. I love your Margiela dress! So pretty! Hi Grace! I saw in your blog, your photo with the boys! I wanted that too, because you can tie the waist. So nice! But I must curb na my desire to shop. Unless it goes on major sale, then I'll buy it too, heehee! Cel, I can't believe you haven't taken full advantage of C21! We must go! Tell me when you're free! Berry and I will go with you! Thanks Belle! We must talk! I'll email you! Our little girls talaga! i don't have kids but i have nieces/nephews so i don't know if my opinion counts. why not give berry something to play with while you do your outfit shots to keep her distracted? Thanks for the tip Ano ni Moose, I've tried that though and it only works for a short short while! Hay! Thanks Ruby! Hehehe! Cuteness matches kakulitan!